With his permission, we have republished this useful tabular summary of the researchers and doctors who have contributed to the discussion of the Harper Fragment. Aguilar, Gary, M.D. Ophthalmologist and major contributor to the anti-Warren Commission (WC) literature; he compiled a long list of Dallas witnesses who saw an occipital defect. He also viewed the JFK autopsy materials with me at the Archives. Angel, Lawrence, Ph.D. Physical anthropologist and consultant to the Forensic Pathology Panel of the HSCA (1977-1979); in his opinion, HF is right parietal bone. Baden, Michael, M.D. Chairman of HSCA Forensic Pathology Panel; he concluded (incorrectly) that frontal bone was entirely intact. Robertson has (mostly) agreed with him about this. Bolleter, M. Wayne Chief Medical Photographer at Methodist Hospital in Dallas; photographed HF before it was turned over to the FBI. Boswell, J. Thornton, M.D. Navy pathologist at the JFK autopsy; his sketches clearly show (significant) missing occipital bone. He also verbally recalled missing occipital bone. Brown, Walt, Ph.D. 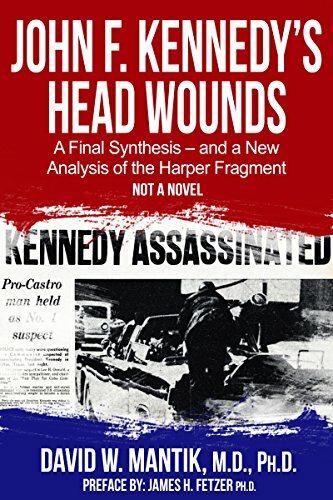 Author of many books critical of the WC, including the essential resource: Master Chronology of JFK Assassination (over 32,000 pages), available for Kindle. Burkley, George, M.D. Admiral and JFK's personal physician, who was present at Parkland and at Bethesda; last known possessor of HF. He later refused to comment on the number of headshots. Not interviewed by the WC. Cairns, A.B., M.D. Chief Pathologist at Methodist Hospital in Dallas; with Drs. Harper and Noteboom, he examined HF before transferring it to the FBI. All three concluded that HF was occipital bone. Costella, John, Ph.D. Expert in optics and electromagnetism; he has extensively studied the Zapruder film and concludes that it is a reconstruction. His stabilized version of the film is an invaluable resource for researchers. So also is his essay, "What Happened on Elm Street? The Eyewitnesses Speak", which is a compilation of eyewitness statements from the WC's 18 volumes -- about what they saw on Elm Street. Cranor, Milicent Story Editor at WhoWhatWhy.org; author of many incisive, and cleverly titled, anti-WC articles. Ebersole, John, M.D. The (sole) navy radiologist at JFK's autopsy in Bethesda; he spoke to Mantik about his recollections of the autopsy. In particular, he recalled (to Mantik) a "big" occipital defect. He later practiced Mantik's own specialty of radiation oncology. Evans, Kathy Former nurse, now in eager pursuit of silver ingots from sunken ships. With Dr. Aguilar, she co-authored the classic paper on (inept) governmental investigations into the JFK murder. Fetzer, James H. Ph.D. Chair or co-chair of five national conferences (1999-2013); organizer of the first Zapruder Film Symposium at JFK Lancer (1996); editor of Assassination Science (1998), Murder in Dealey Plaza (2000) and The Great Zapruder Film Hoax (2003). His M/W/F radio show, "The Real Deal" (with over 880 episodes), featuring "The New JFK Show", has gone video at "The Real Deal on MBC TV". His latest articles are at http://veteranstoday.com/author/fetzer, while he co-edits assassinationresearch.com with John P. Costella. Fiester, Sherry Certified Senior Crime Scene Investigator and author of Enemy of the Truth: Myths, Forensics and the Kennedy Assassination. Mantik's review of her book is here. Fitzpatrick, John, M.D. Forensic radiologist and consultant to the ARRB. He observed that significant frontal bone was missing, but he was particularly puzzled by the 6.5 mm object, which he could not explain. No one saw this object on the X-rays during the autopsy. Harper, Jack, M.D. Uncle of Billy Harper; together with Drs. Cairns and Noteboom, these three pathologists examined HF before turning it over to the FBI. Harper, Billy Discovered HF on the infield grass in Dealey Plaza on Saturday, November 23, 1963. Horne, Douglas Chief Analyst for Military Records for the ARRB and author of Inside the ARRB: The U.S. Government's Final Attempt to Reconcile the Conflicting Medical Evidence in the Assassination of JFK. He is the only former member of the ARRB to publish his insights and recollections. Humes, James J., M.D. JFK's chief pathologist at Bethesda; while before the ARRB, he identified his EOP entry site in such a way that autopsy photograph F8 must be a posterior view. His official autopsy report describes the skull wound as extending into the occiput. Hunt, John Independent researcher who has made many visits to the National Archives; he supplied the images in this essay of the HF X-ray and also the FBI photographs of HF. Jenkins, James C. Autopsy technician at Bethesda Naval Hospital. He stood next to JFK's body during the autopsy and recalled a large occipital defect. He also saw a bullet entry near the right ear and a plastic bag with bullet fragments and bone fragments (which he had not seen being removed) lying next to JFK's head during the autopsy. Kirschner, Robert, M.D. Forensic pathologist and consultant to the ARRB. Like me, he saw fatty tissue in the corner of autopsy photograph F8, which he interpreted as abdominal fat. This is consistent with F8 as a view of the posterior skull. Law, William Matson Author of In the Eye of History: Bethesda Hospital Medical Evidence in the JFK Assassination (2005). This book contains Law's interviews with Dennis David, Paul O'Connor, James Jenkins, Jerrol Custer, James Sibert, Francis O'Neill, Harold Rydberg, and Saundra Spencer. Mantik wrote the Foreword. Lifton, David S. Author of Best Evidence, a best seller and also a Book of the Month selection. He also produced extensive videotapes of the key JFK medical witnesses. The latter can now be viewed for free on YouTube. Lifton is chiefly remembered for raising the issue of body alteration between Parkland and Bethesda. Mantik, David W. Ph.D. in physics (Wisconsin); post-doctoral fellowship in biophysics (Stanford); tenure-track physics faculty (Michigan); M.D. (Michigan); radiation oncology residency (USC); certified by the American Board of Radiology; director of residency training at Loma Linda University, where he treated cancer with proton beams. He has viewed the JFK autopsy materials at the Archives on nine separate visits and has made hundreds of optical density measurements directly from the extant JFK skull X-rays. His lecture on altering X-rays is here. McAdams, John C., Ph.D. Polemicist and acerbic supporter of the WC, he attended Kennedy High School in Kennedy, Alabama. He taught courses on American politics and public policy at Marquette University in Milwaukee, but he is now suspended (with pay) and may be dismissed from the faculty. Mantik's review of McAdams's JFK book is here. Nicholson, Tim Stanford-trained engineer and bicycle enthusiast; he has developed detailed mathematical models of the shooting in Dealey Plaza. Noteboom, Gerard, M.D. Pathologist at Methodist Hospital in Dallas; he examined HF together with Drs. Cairns and Harper; all three concluded that it was occipital bone. Purdy, J. Andrew, J.D. Staff lawyer for the HSCA; he interviewed many medical personnel, including Drs. Cairns and Harper. Riley, Joseph, Ph.D. Neuroanatomist who placed HF into the right parietal area. His (mistaken) view was based on his claim that occipital bone does not contain vascular grooves or foramina. Robertson, Randy, M.D. Diagnostic radiologist who accepts the JFK autopsy photographs and X-rays as authentic. He does not accept any medical witness (at Parkland or Bethesda) who saw a large occipital defect. He also (1) accepts a variant of the single bullet theory and (2) believes that JFK's cerebellum was intact. Seaton, Paul Single-minded WC supporter, who has posted his online discussion of HF. Speer, Pat Independent researcher, usually critical of the WC. He cites at least three posterior shots (but no frontal shots), and he places HF into the parietal area. He also apparently believes that the autopsy photographs and X-rays have not been altered. My critique of Speer's whimsical scenarios is here. Schwinn, Quentin Imaging specialist who, while a student at the Rochester Institute of Technology (several years after the sunset of the HSCA), saw an apparent authentic autopsy photo with a frontal entry wound in the right high forehead, near the scalp. Stringer, John Navy employee and chief photographer at the JFK autopsy. He initially recalled a large occipital defect, but then later changed his mind (without seeing any new evidence). Thomas, Donald, Ph.D. U.S. government entomologist and expert on the acoustic evidence from the police Dictabelt. He places HF into the parietal area. He also accepts a variant of the single bullet theory. Mantik's review of Thomas's book is here. Thompson, Josiah, Ph.D. Former professor of philosophy, who later became a private detective. One of the first generation of WC critics, he wrote Six Seconds in Dallas, but more recently has written Last Second in Dallas. Tobias, Richard Independent researcher who has posted his opinions of HF online. Wecht, Cyril H., M.D., J.D. Member of the HSCA Forensic Pathology Panel and archnemesis of the WC, but especially of the single bullet theory. He was coroner of Allegheny County and is past president of both the American Academy of Forensic Science and the American College of Legal Medicine. He has authored many books and articles, especially of high-profile forensic cases. He co-authored an article on JFK's brain with Mantik and also visited the Archives with Mantik.